About 4000 fans have crowded the foreshore at the Sydney Opera House to meet the Australian cricket team and celebrate their ashes win. THE Ashes may have finished but the celebrations continue, with thousands of fans turning out in Sydney to revel in the cricket clean sweep with Australia’s triumphant Test team. One of those fans at Sydney’s Opera House was Prime Minister Tony Abbott. “A great summer is one where Australia beats England, and didn’t we whip them in this particular series,” Mr Abbott quipped to the crowd of around 4000, many of whom were decked out in green and gold. Speaking from a stage specially set up for the event, Mr Abbott thanked the Aussie team for showing “the grit and the character which you displayed this summer”. Cricket fan Matthew Fulcher, 17, put a different spin on the 5-0 thumping. “England were piss poor,” the Baulkham Hills resident, and all-rounder, told AAP. He said he was most pumped up about getting close to Aussie skipper Michael Clarke. “I’ve been watching him on TV for eight or nine years and seen him become the player he is today,” Mr Fulcher said. 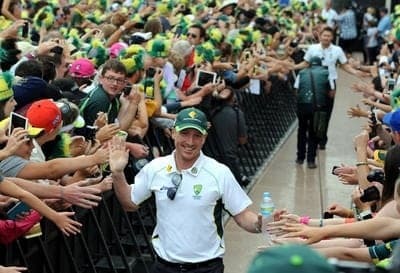 Clarke, when he took the stage, had nothing but kind words for the team’s legions of fans, some of whom wore Aussie team shirts, caps or carried mini cricket bats in the hope of snagging an autograph. “We’ve had so much support from the Australian fans,” Clarke said. “You really feel that as players, and I think that’s what is important to us today,” he added to applause. There were also big cheers for Australia’s moustachioed man of the series, fast bowler Mitchell Johnson. To the relief of those present, Johnson, who took 37 wickets in the series, reassured the crowd he would persist with the handlebars look on the upcoming tour of South Africa. “I’m actually going to shave it but … I’ll grow it for South Africa and for the future,” he said. The team’s coach Darren “Boof” Lehmann said he was very happy with the “nice, aggressive, hard” cricket played by his charges in the series whitewash. But he suspected the team would need to get back into training after celebrating “the last couple of days” since the SCG win. “We’re about trying to get better on and off the field,” Lehmann told the crowd. After parading past fans, each player was introduced before taking a seat on the stage alongside Mr Abbott and other dignitaries, including Sports Minister Peter Dutton. The event culminated with Clarke and vice-captain Brad Haddin hoisting a replica Ashes urn and crystal trophy over their heads as fireworks exploded behind them. Players then mingled with fans, some of whom had queued for hours to get a prime spot for the event. Six-year-old Will, who was dressed in full Aussie one-day kit complete with helmet, said he just wanted to see his hero, David Warner. “He’s a very good batsman,” the youngster informed AAP.